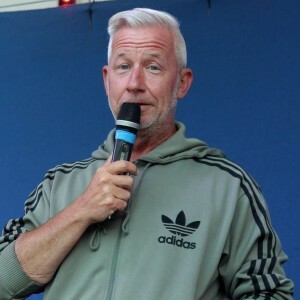 Great friend of the Festival and local radio presenter from the ‘Wake up with Webbo’ show on Radio Ashford, John ‘Webbo’ Webster is back this year to be the ‘voice’ of the festival. Webbo makes presenting look easy, and is on hand to make sure festival goers are engaged and know what is going on. A huge supporter of the Festival Webbo, will take to the stage on Saturday 9th and Sunday 10th July introducing acts and informing you of what is happening throughout the day and evening. He will also be having guests on his morning show the week leading up to the festival. This is the Festival’s 11th year….John how important are events like this one important to Ashford? We are blessed in this town to have an abundance of musical talent and some great pubs for them to show off their skills, but you can’t beat a festival and the Festival in the Park epitomises this with a little bit of everything, for everyone. Mr Lockett always gathers an eclectic mix of artistes and prides himself on the variety he puts on show. I for one applaud it. You are no stranger to comparing the Festival tell us a bit more about your involvement again this year? Edward is a friend of mine, and he is very big, so I was never going to say no when he asked me, was I? I was working on a rather inferior radio station at the time, but was obviously keen to promote a local festival on air and of course help compare the weekend with debbie Dawson and, back at the start, the ever so cuddly Mick Hubbert. I feel honoured and humbled to be asked back year after year, I suppose I must be doing something right. I remember watching my first ‘live’ music gig, which was literally a couple of hundred yards from where we hold the festival in North Park. Showaddywaddy played The Stour Centre and I was never the same again, it changed everything, it blew me away! Live music beats it all, so I welcome young and old and everything in between to experience it in a friendly family environment. Wake Up With Webbo is on every weekday morning across the Radio Ashford network, Have you had any Festival acts in on the show yet? And who are you looking forward to seeing this year? I have had many an act on my show over the course of time, and loved each and every one of them. I marvel at musicians and singers. I haven’t a musical bone in my body and I’m completely tone deaf, so I’m always in awe of their talent (although I do get my Elvis impersonation out every year). I will be expecting a few more acts to darken my studio door during the build up and can’t wait. It’s one of the highlights of the year for me, so without wishing my life away, I’m chomping at the bit!